What is a Justice Funder? To receive a hard copy of the Resonance Framework, please make a contribution to support Justice Funders’ work of powering philanthropic transformation. Many philanthropic institutions have begun aspects of the transition towards transformative philanthropic practices that build a regenerative economy, from which regenerative philanthropy flows. Below, we include stories of real organizations grappling with core elements of a comprehensive and fundamental shift towards a Just Transition. F4DC was founded in 2007 by Ed Whitfield and Marnie Thompson when Marnie’s father, who had been involved in a manufacturing business and private equity investing, was in declining health. He wanted the portion of the family wealth that would be passed down to Marnie to be invested in a non-taxable foundation, since he understood that she was going to give it away anyway. Marnie asked Ed to help her build a foundation, and he agreed on the condition that the resources would go towards the work they had been doing together for years to nurture authentic grassroots democracy. F4DC’s basic framework has two components. First is the importance of promoting self-reliance and self- determination. Rather than calling on an unresponsive federal government to take care of a community’s problems, they believe that armed with sufficient resources and skills, communities can build the organizations and enterprises that meet their own needs. Based on this framework, F4DC has put considerable effort into creating sustainable financial institutions that are rooted in grassroots communities and serve to redirect assets to community-based control. They have supported economic development projects like the Renaissance Community Cooperative (RCC), a community-owned grocery store in Greensboro, NC in what was previously a food desert in a working class, majority black community. The RCC, local to Greensboro where F4DC is based, is connected to South-wide and national efforts to democratize wealth. RCC was one of the first borrowers from the Southern Reparations Loan Fund (SRLF), which makes loans to community-based businesses anchored in the most marginalized Southern communities. The concept of reparations is at the heart of SRLF’s mission as it moves capital taken from an economy rooted in extraction, land theft, slavery and exploitation and uses this capital to build enterprises that are owned and democratically controlled by the communities from which the wealth was stolen in the first place. SRLF, in turn, is part of the Financial Cooperative, a network of place-based, non-extractive loan funds that share capital, learning and backend services. SRLF and the Financial Cooperative have been supported by F4DC with both grants and investment dollars. are devastated by gentrification and displacement, which foundations try to abate with their grantmaking. Instead, Marnie and Ed have decided to put F4DC’s resources back into the community at a rate of more than the returns on their investments in order to have a larger impact by investing in people, rather than stocks and bonds. In 2010, they decided that F4DC would sunset in 2020. For them, “legacy” is not about living in perpetuity. It’s about challenging the assumption that those who hold accumulated wealth should make all the decisions about how it gets distributed, as though people working in philanthropy know better what to do with it than those whose sweat and toil created the wealth. It’s about supporting the creation of new, lasting structures that allow for reinvestment in productive community businesses that foster self-reliance and self-determination. For F4DC, regenerative philanthropy means putting concentrated wealth under the democratic control of communities for creative, productive activity to build a new, more humane world. Thousand Currents is a public grantmaking charity that partners with grassroots organizations led by or serving women, youth and Indigenous Peoples in the Global South. Because so many of their grantees are engaged in creating local economies that build wealth – not just income – for their communities, in 2016 they came together with their partners in the Global South and their philanthropic partners in the U.S. to build an impact investment fund from scratch. The Buen Vivir Fund is rooted in the deep experience and wisdom of their grassroots partners about how to build economic well-being for whole communities on collective interests and solidarity, rather than on competition and individual wealth accumulation. Buen vivir, or “good life,” is an Indigenous philosophy and worldview at the root of many movements in Latin America that implies a life in balance with community, natural systems and future generations. Departing from the usual duality of “investors” versus “investees,” everyone is expected to uphold the same roles and responsibilities, coming together as equals as voting members and decision-makers. Rather than having the terms and conditions of the investment capital set by investors to minimize their own financial risk, financial investors agree to take on the majority of the risk to shift risk away from grassroots groups. Instead of paying interest at a set rate, with earnings returned to investors, borrowers make a solidarity contribution of their choosing, based on their project’s success. Financial returns are not transferred to investors; they are passed forward as increased abundance (and resilience) to the next generation of projects in the Fund. Moving away from the assumption that communities with less economic wealth need the “help” and expertise of those with more wealth, the Fund is designed to provide a two-way flow of “helping” and “upskilling” the financial investors involved. The positive change and impact that the Buen Vivir Fund fuels in the world happen through all its members – regardless of which community or demographic group that member comes from. Outside of the Fund itself, Thousand Currents plans to spread economies of buen vivir and influence how foundation assets are invested through their Buen Vivir Finance Fellowship. The 2-year fellowship trains finance professionals in the Buen Vivir Fund methodology, then places them into the foundation investment world to influence how foundation endowments are invested using a Buen Vivir investment strategy. Their hope is to fundamentally transform the field of impact investing for generations to come – and, ultimately, financial investing overall – so that power is shifted from financial investors to communities who are involved. For Thousand Currents, this is what it looks like to reimagine wealth and to put well-being and abundance at the center of their investment and philanthropic practice. Instead of approaching the work with fear and grasping for control, what emerges is gratitude for – and faith in – what is possible when we all care for one another’s buen vivir. Chorus Foundation was created in 2006 with the desire to support work that effectively responded to the climate crisis. After studying what most “climate funders” were supporting at the time – individual behavior change, market-driven energy efficiency and top-down policy change – Chorus chose instead to spend time visiting and learning from communities directly impacted by the fossil fuel industry. Large scale social change requires social movements. Organized social movements are essential to transforming the landscape of power and political will. Chorus has seen that authentic social movements have always been led by those on the front lines of crisis – in this case, the communities of color and working class communities that are most intimately familiar with the fossil fuel industry. Systemic problems require systemic solutions. Chorus understands that the climate crisis is the ecological product of an extractive, exploitative system that has created similar crises in both our economy and our democracy. They believe that progress on any one of these crises is dependent on addressing the other two. Place is where these things really come together. Through the work that they’ve supported, Chorus has seen how these multiple crises can unfold simultaneously in the same community, and how community leadership in response to these crises provides the most promising roots for successful movement building. These three lessons have become the primary lens through which Chorus evaluates strategy, which can be summarized in a single question: What is a place-based, social movement strategy for systemic change? Chorus believes that a Just Transition strategy does not simply address climate change as an ecological crisis, but also addresses the political and economic inequity at its roots. With Just Transition as their North Star, Chorus’ grant making has evolved steadily over time. First, they shifted focus to support multi-issue, power-building organizations in communities of color and working class communities. This decision was grounded in the belief that power built from the bottom up around multiple issues – with solutions developed by those most impacted by the problem – will be broad, lasting power. Then, Chorus chose to prioritize accountability to relationships with grantees rather than fidelity to funder-created processes, metrics or objectives. They believe that for funders to effectively support social change ecosystems, they must be an authentic part of the web of relationships that make up those ecosystems. At the same time, Chorus realized that supporting an entire ecosystem would require all the tools in the funding toolbox (501c3, 501c4, investments, etc). In particular, Chorus aspires to invest their endowment in economic initiatives that build community wealth and power in the same places as their grantmaking. In 2013, Chorus made the decision to spend down entirely by 2023, both to avoid any scenario where “existing in perpetuity” became its own mission and to deploy resources as quickly as possible to address the urgency of the climate crisis. Knowing that they’d be funding their grantees until they ran out of money, they decided to commit it up front by making long-term, general operating commitments to anchor grantees in specific places. They understood that restricted, short-term grants – which constrain grantees to simplistic, transactional approaches to meet funder objectives – are examples of philanthropy trying to give away money while maintaining power. They also began to co-design content, processes and strategies with their grantees to honor their expertise and experiences in a way that makes Chorus a more effective and strategic grantmaker. Chorus’ trajectory to date has been rooted in the deeply-held belief that private philanthropy requires the extraction and consolidation of wealth. Believing that private philanthropy must hand resources and power back to the communities from which that wealth was extracted, Chorus has begun to hand grant making decisions over to their grantees. Through experiments such as activist-led grant making, participatory budgeting and cooperative, non-extractive loan funds, Chorus and their grantees are learning together to answer the question: What can radically democratic resource allocation look like? The Building Equity and Alignment Initiative brings together dynamic grassroots organizing groups, effective national green organizations and innovators in philanthropy to build a more powerful, diverse and inclusive climate justice and environmental movement. One way that the BEA advances alignment and equity is by convening breakthrough conversations across sectors through multi-day “forum” processes, which bring a selected group of leaders together for shared learning and facilitated strategy discussion. A forum on the Just Transition was the second such event, and was the largest and most ambitious BEA gathering to date, advancing a vision of an alternative economy that is at once climate protective, healthy for people and remedies the historic inequities of racism and wealth concentration. Manifesting this vision requires a massive, broad-based, powerful social movement and a diverse array of strategies. The Just Transition Forum was also conceived with a sense of urgency in the wake of rapid global warming, the rising right wing and the deadly climate disasters gripping Houston, Puerto Rico and communities across the global south. 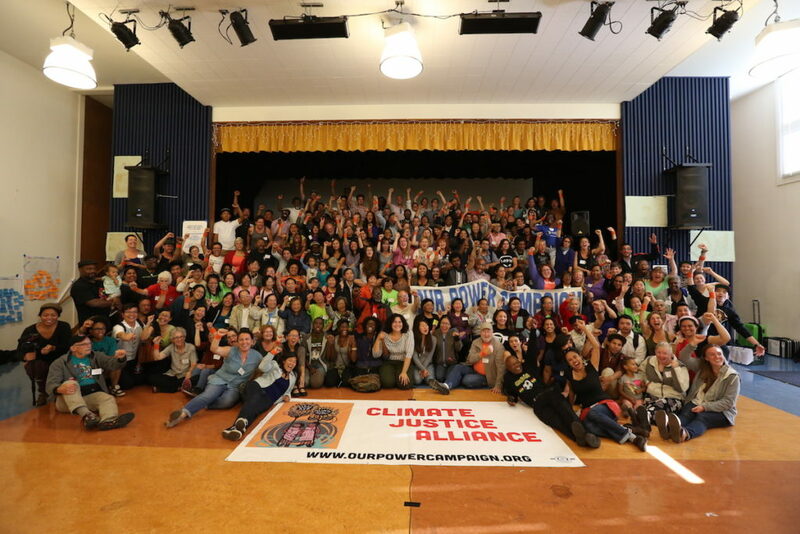 This gathering was a strategic circle that came together to build a broad Just Transition movement that can wield real political power, because that is what our planet and communities require. The Forum was hosted by Cooperation Jackson in Mississippi – long a center of the Black freedom struggle. 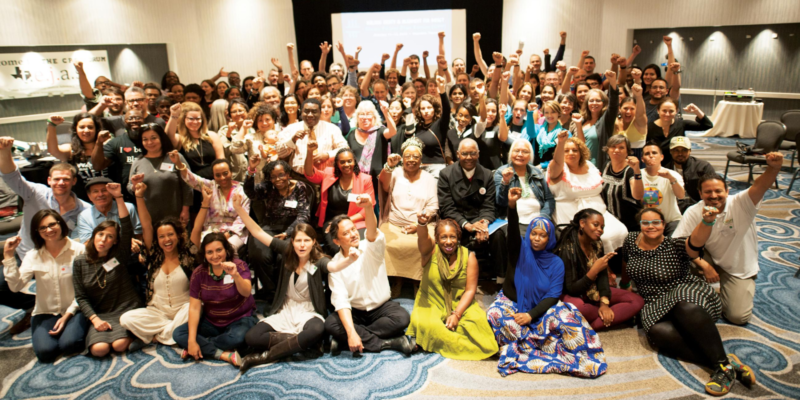 With over 180 participants from every region in the U.S., the Forum was a three day sojourn into the histories, strategies and futures for a Just Transition movement in the United States. Forum participants explored Just Transition themes in working roundtable discussions and developed six different proposals for continued collaboration. 19. Sarah Hanson, Cultivating the Grassroots: A Winning Approach for Environment and Climate Funders. National Committee for Responsive Philanthropy, 2012. https://www.ncrp.org/publication/cultivating-the-grassroots. What is Extractive Versus Non-Extractive Finance? The Financial Cooperative and The Buen Vivir Fund are two examples of funding mechanisms that embrace the concept of non-extractive finance. The concept of non-extractive finance was pioneered by The Working World  a community development fund that provides loans to businesses that are building local, regenerative and democratic economies. Non-extractive finance vehicles provide loans as a mechanism of building local wealth through community and worker ownership without the burden of collateral or extractive debt typical of conventional finance. Loans are often given to workers and businesses that are excluded from — and even exploited by — conventional finance, and are expected to be paid back only when the enterprise succeeds. A core value of non-extractive finance is that loans should leave businesses better off, not worse, than when they started. As philanthropy undergoes a transition towards non-extractive financial practices in their investments, our field can serve as a model for the rest of the economy to follow our lead.